Mount Shasta is a volcano located at the southern end of the Cascade Range. At an elevation of 14,179 feet, it is the second highest peak in the Cascades (after Mount Rainier) and the second most prominent peak in California (after Mount Whitney). Mount Shasta has seven glaciers, the largest in California. Casaval Ridge, separating the mountain's West Face from Avalanche Gulch and Sargents Ridge, is the classic winter climbing route. 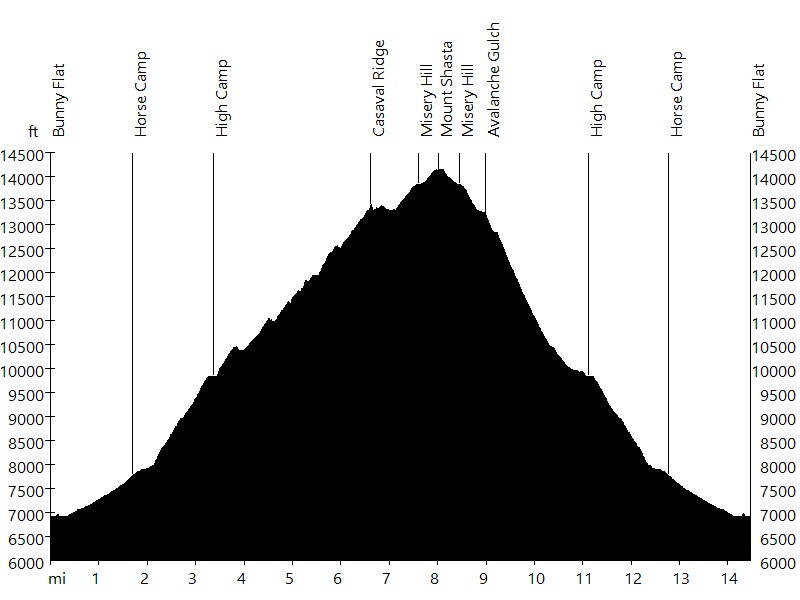 The route starts at Bunny Flat (~7,000 ft) and passes Horse Camp on the way to High Camp (~10,000 ft), located in a saddle on the ridge or at Helen Lake. The route continues to lead up to the left of the rock spires, including traversal of 30 to 40 degree terrain and a few 50 degree climbs to the ridge proper. From the top of Casaval Ridge it is another 1,000 vertical feet to the summit, which becomes visible after Misery Hill. The descent leads around Red Banks and down Avalanche Gulch. While Sandra was running the Boston Marathon, I climbed Casaval Ridge together with three guides (Patrick C., Ryan S., Cobi K.) and six other clients (Adrian F., Gustav D., Faisal S., Josh V., Metin D., Tristan M.). Congratulations and thanks to everyone for a great adventure.